The system is based on the DPOS (delegated proof of stake) technology in order to minimise the production costs and times related to the transactions. The maximum coins offer will be of 70.000.000. with a quantity of currency issued on the market equal to 2.000.000. There will be pre-forged 33.000.000 coins of which 20.000.000 will be used as voting wallets for 20 associated partners, therefore the 20.000.000 SKP will be freezed and will be not put in circulation in any way: their only aim will be to vote 20 delegated partners of the Skelpy network. Besides we will use a backup fund of 10.000.000 in case of network alteration or modification, that will be freezed and available through multi-signature wallets. 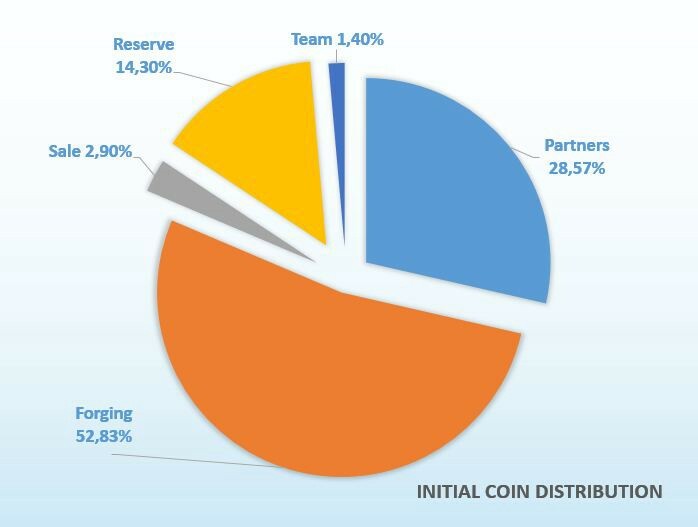 2.000.000 will be used for exchanging on various exchange and 1.000.000 will be divided among the team members on the basis of the competence and the developed works. The 20 delegates (also called partners)’ task is to guarantee reliability, speed and security of the network. Therefore, the partners will be voted by 1.000.000 SKP wallets, after having stipulate a cooperation contract with the project. The Skelpy Project commits to supply the best solution of its system to its partners on the basis of the terms of the stipulated contract.